I’ve seen and you’ve seen this “Promise” displayed, shouted, “CLAIMED” and used innumerable times. If you haven’t, I wonder where you’ve been in the last few years. I want us to Think about this a wee bit. QUESTION: Is this Promise for genuine, Born Again, Follower-Disciples of Jesus Christ, today? Since, Acts 2, The Day of Pentecost, The Birth of the Church, does the “Promise” of Jeremiah 29:11 apply to us, the church of Jesus Christ, today? I ask this because we must know and understand that NOT everything in the Bible applies to us, today. WHAT? Andy that is Heresy!!! Well, let me see if we can look at this with level heads, and what I like to call Holy Spirit-Empowered, Biblical Common Sense. Ask yourself: Do all the Promises, Commands, Principles, etc. that were specifically for the High Priest and his family (the family of Aaron and his descendants) apply to us today? The Answer is obvious: Of Course NOT. The Tabernacle and the Temple are destroyed, they are no longer standing. The Levitical Priesthood has been disbanded. Based on these two facts, alone, along with the Book of Hebrews (which addresses this, as well), we know that those Promises and Precepts specific to the Israeli, Levitical Priesthood do NOT apply to Biblical Christians, today. There is a verse that addresses this by Principle: For ALL the promises of God, in Him, are Yes, and in Him, Amen, to the glory of God through us (2 Corinthians 1:20). This means that there are Certain, Specific sets of Promises, Precepts (commands), Principles, and Patterns (Precedents, Examples, etc.) that apply to Christians. There are certain, specific Promises, Precepts, Principles, and Patterns that apply to Israel. Some applied to Israel under certain specific historical contexts, such as during the Babylonian Captivity, as well (e.g. : Jeremiah 29). Some applied to Israel while they were under the Judges. Others applied to the period of time while Judah and Israel (northern kingdom) were under Kings. And so on. Do you see what I am getting at here? Context and Covenant are your friend when it comes to finding what applies to us and what doesn’t. Not everything in the Bible Applies to us, now, here, today. For women who are in Christ, some Promises, Precepts, etc. do not apply to women, but specifically to men. And the reverse is true. Some apply to children, while they are still living in the home, under the authority of their parents. Thus, depending on who you are, your gender, your age, etc. will affect which Promises, Precepts, Principles, and Patterns apply to you, specifically, as well. And, yes, there are General Promises to all mankind, such as seen in Genesis 9. 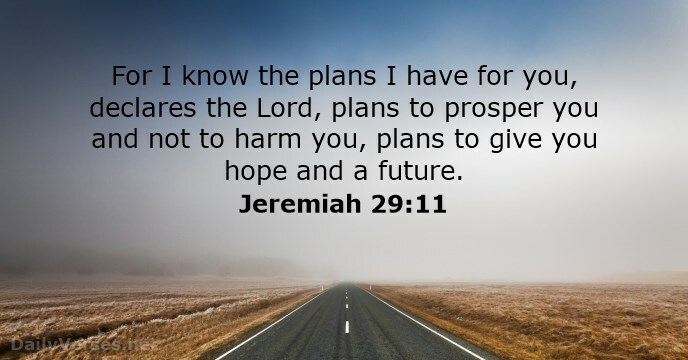 The verse that we started with: Jeremiah 29:11 – therefore, specifically applies to Israel, and was spoken of during the time of their Babylonian Captivity. It does NOT apply to the church, the Body of Christ. I hope you know that there are specific promises God has given the church that show that God will never leave us, nor forsake us (see Hebrews 13:5 and Matthew 28:20). I urge you, therefore, to read the entire chapter of Jeremiah 29, in context, and let God’s Word speak, by His Spirit. Here is a snippet of that chapter: which is about Judah (the tribes of Judah, Benjamin, and Levi) in Babylonian Captivity, living in a foreign land and how they need to rely upon God and His Word, as well as build their new homes there and be God’s Blessing to the natives in the lands that they are in Captivity, etc. Jeremiah 29:10-13: For thus says the LORD: After seventy years are completed at Babylon, I will visit you [i.e. : the people of Israel] and perform My good word toward you, and cause you to return to this place. (11) For I know the thoughts that I think toward you, says the Lord, thoughts of peace and not of evil, to give you a future and a hope. (12) Then you will call upon Me and go and pray to Me, and I will listen to you. (13) And you will seek Me and find Me, when you search for Me with all your heart. (14) I will be found by you, says the Lord, and I will bring you back from your captivity; I will gather you from all the nations and from all the places where I have driven you, says the Lord, and I will bring you to the place from which I cause you to be carried away captive. Jeremiah 29:11 , therefore, is a National Promise from the God of Israel to a specific People Group, to a specific Nation: the People of Israel, and specifically to those who were in the Babylonian Captivity. It was within a specific Geographic, Historical, and Covenantal Context – within a Limited Scope of Application. If this helped you and/or was a Blessing to you, please, forward this to others who may also need to be helped.